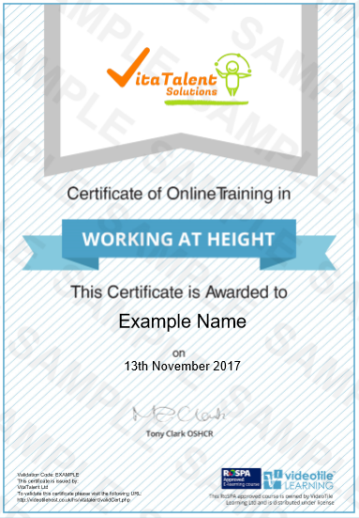 This course is aimed at anyone who undertakes work at height, or who employs people who regularly work at height. The term work at height applies to a wide range of situations ranging from the obvious ones like working on platforms, ladders, scaffolds or stages to working alongside deep trenches. This is because the crucial thing to understand about work at height is that it’s not how far you climb, but how far you can fall. ‘Falls’ doesn’t just mean people falling from heights. If materials or equipment fall, that will obviously present an equally dangerous hazard to anyone below. All working at height situations are covered by health and safety legislation. Chief among these is the Work at Height Regulations 2005. These regulations confer legal duties on employers and employees to assess, control and minimise risks and hazards from work at height. This course covers topics including the dangers of working at height, the regulations, the hierarchy of controls, assessing risk and much more. It’s vital to understand all this because as I’m sure you’ll know, working at height can be extremely dangerous. Instant Certification on completion of all modules and test pass rate of 70%.